A hammertoe is a toe that is bent because of a weakened muscle. The weakened muscle makes the tendons (tissues that connect muscles to bone) shorter, causing the toes to curl under the feet. Hammertoes can run in families. They can also be caused by shoes that are too short. Hammertoes can cause problems with walking and can lead to other foot problems, such as blisters, calluses, and sores. Splinting and corrective footwear can help in treating hammertoes. 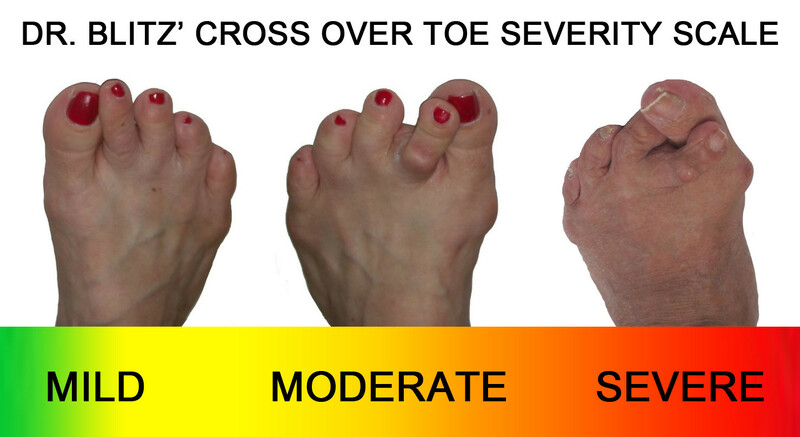 In severe cases, surgery to straighten the toe may be necessary. The exam may reveal a toe in which the near bone of the toe (proximal phalanx) is angled upward and the middle bone of the toe points in the opposite direction (plantar flexed). Toes may appear crooked or rotated. The involved joint may be painful when moved, or stiff. There may be areas of thickened skin (corns or calluses) on top of or between the toes, a callus may also be hammertoes observed at the tip of the affected toe beneath the toenail. An attempt to passively correct the deformity will help elucidate the best treatment option as the examiner determines whether the toe is still flexible or not. It is advisable to assess palpable pulses, since their presence is associated with a good prognosis for healing after surgery. X-rays will demonstrate the contractures of the involved joints, as well as possible arthritic changes and bone enlargements (exostoses, spurs). X-rays of the involved foot are usually performed in a weight-bearing position.